Honoring scientists who have made important and lasting contributions to the sciences of mind, brain, and behavior. Keith Rayner was, more than any other person, responsible for how eyetracking methodology rejuvenated research in reading. His methodological and theoretical innovations sparked the experimental work on sentence processing that dominated the field of experimental psycholinguistics for decades. His contributions to the experimental study of reading have had a major impact on practice by professional reading educators and clinicians interested in reading disorders. His reviews of the field (Psychological Bulletin, 1978 and 1998) are the standard references on the eye movements and higher cognitive processes. He is on the list of “most frequently cited psychologists” prepared by the Web of Science. His own research has established some empirical phenomena that will endure long after today’s theories have become yesterday’s. 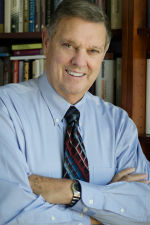 And his work as mentor of graduate students and postdoctoral fellows and trainees, as well as his editorial work and other contributions to the profession of psychology, have helped ensure that the study of cognition will continue to be both scientifically sound and intellectually exciting. In his early research, Rayner developed techniques for measuring eye movements during normal reading and used them to measure the perceptual span in reading. In a long and productive line of research designed to answer such questions, Rayner and his colleagues discovered that the span is determined by attentional factors, and that it is asymmetric, skewed in the direction toward which attention is shifting. Rayner’s research has examined many important questions, including how information is integrated across fixations in reading, how phonology is involved in silent reading, and how linguistic knowledge is brought to bear in the process of comprehending what one is reading. In recent years, Rayner and his colleagues have developed an explicit, implemented model of reading (the “E-Z Reader Model”), which has inspired the development of several related and competing models of eye movement control in reading. This explicit modeling work has introduced a new level of precision into the study of the process of recognizing words during reading and how this process controls eye movements. Rayner’s recent work focused on the fundamental processes of how we recognize words and how word recognition controls eye movements. He explored these topics in readers of Chinese, in deaf individuals, and in older readers, among other populations, always searching for both universals of processing and for differences in how different groups read. Rayner’s research has had a major impact on applied approaches to the study of reading. By making the process of reading less mysterious, more open to experimental study, it has permitted educators and clinicians to think straightforwardly about what processes may be disrupted in cases of dyslexia, delayed reading and reading impairment. Many academic honors have come Rayner’s way, including membership in the Society of Experimental Psychology, election to the Bartlett Lectureship of the Experimental Psychology Society, and receipt of the first Outstanding Scientist Award from the Society for the Scientific Study of Reading. Much of Rayner’s career was spent at the University of Massachusetts Amherst, where he established the Eyetracking Laboratory, still an active and productive lab. He was most recently Distinguished Professor at University of California San Diego, holder of the Atkinson Chair in Psychology. At both institutions, he mentored over two dozen PhD recipients and at least an equal number of post-doctoral scholars, a great many of whom have gone on to distinguished careers. They all profited from his clear-minded insistence on letting conclusions be guided by data, not by prior theoretical commitments. * The FABBS Foundation would like to thank Drs. Charles Clifton Jr., Arthur C. Graesser, Brooke Lea, and Caren Rotello for nominating Dr. Rayner for this honor and for leading the effort to spread the word about his nomination. Would you like to honor Dr. Rayner? It’s not too late to have your name added to the list of donors! You can make your donation to Dr. Rayner’s In Honor Of… campaign at anytime. Copyright 2017-2019 Federation of Associations in Behavioral & Brain Sciences. All rights reserved.